There are few things my husband Jeff enjoys more than a delectable fresh seafood dinner, preferably starring a big, juicy lobster. Long ago, we gave up the idea of going to restaurants that don’t serve us from a drive-thru window. We have three kids, and two of them are wild boys whose idea of a restaurant involves anything with an attached arcade and giant characters delivering pizza. We’re not fancy. Normally, I can’t stomach the thought of where my food was before I brought it home, nicely packed in its little non-chicken-or-cow-looking package. But as I stared into the beady eyes of Justin Timber-claw last summer, I knew my lobster-murdering days had come at last. I made two trips to the grocery store that day. On the first, I hung around the lobster tank like a stalker. Three different butchers politely came to my aid to ask if I needed any help. “No, no, just looking,” I stammered. Such a wimp. I left the store after twenty minutes without a lobster, hanging my head in shame. 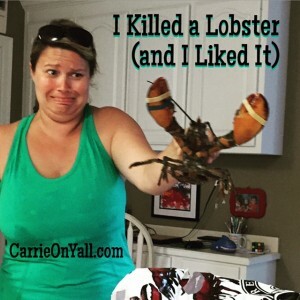 My husband felt it was his duty to make fun of me when I arrived home sans crustacean. And he was hungry. “Chips and salsa only go so far, Carrie. I need some real food.” I downed some liquid courage and returned to the grocery store to face the lobster tank once more. 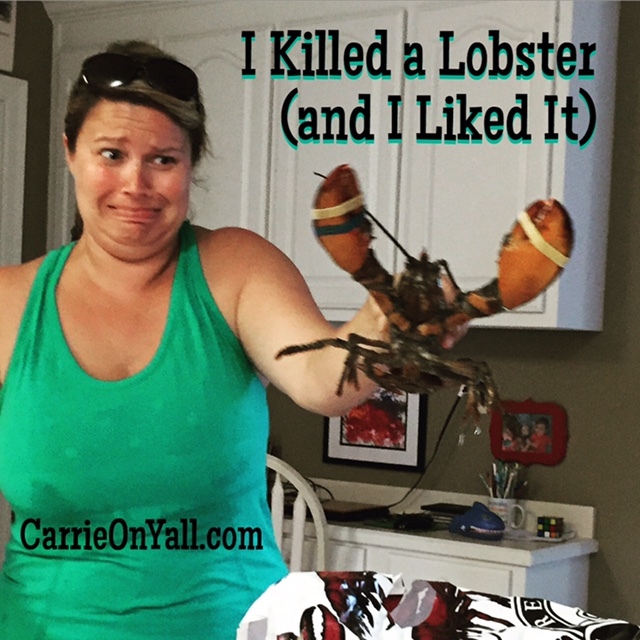 I solemnly chose a large lobster for us to share (double murder on my first try seemed a little callous). Jolly Roger the Lobster made a slight fuss and terrified the cashier as he slowly rode down the check-out conveyor belt like a man to the gallows. She asked me to scan the bag because it was moving. “Me? I’m scared of it, too!” I cringed. “Then why are you buying it?” she admonished. “An excellent point, ma’am,” I admitted. I scanned a squirming JR for her and tiptoed to my car holding the box as far away from my body as I possibly could. We attracted attention. Jolly Roger rode in the way back of my SUV, and I could hear him shuffling around in the box. The butcher assured me that the rubber bands on his claws were secure so I might not lose a finger in this fool’s errand. When Rog and I arrived home, the kids were predictably fascinated. We chilled him in the fridge for a while as instructed by some YouTube video Jeff found while I was gone. “Good grief, Carrie. We aren’t going to hold a funeral for our dinner. Do you want me to do it?” At this point, Jeff was just plain hangry and wanted to get this over with. I lifted Jolly Roger by the large part of his shell as instructed by YouTube and said a silent eulogy for the condemned crustacean whose only crime was to be stupid enough to end up in a lobster trap, though apparently lobsters are not known for their intellect. I plunged him headfirst into the already-boiling water and slammed the huge lid on the pot. I covered my ears because there’s some rumor that lobsters make a terrible noise when they’re meeting their Maker. Not our Jolly Roger. He went quietly into that good night, bless him. My friends have asked if I would murder another lobster, and the answer is a resounding yes. I have, in fact, sent a few more of JR’s friends to lobster heaven to meet with him there. Thanks for reading, y’all! If you like what you’ve read, please head to Carrie On Y’all and look around. You can follow me on Facebook, Twitter, and Instagram. My boys love saying hello to the lobsters at the grocery store! I’ve yet to murder one, but I’ve been a material witness at least a half dozen times.